This summer we welcome Brothers Brendan Baran and Bernard Knapke as they spend two months at St. Vincent de Paul. The Brothers are living at St. Rose Priory in Springfield, Kentucky while they train to become Catholic priests and visit our campus two days a week. While on campus they’ve helped in the Food Pantry, organized a book giveaway, helped in the Ozanam Inn garden, and visited with campus residents. 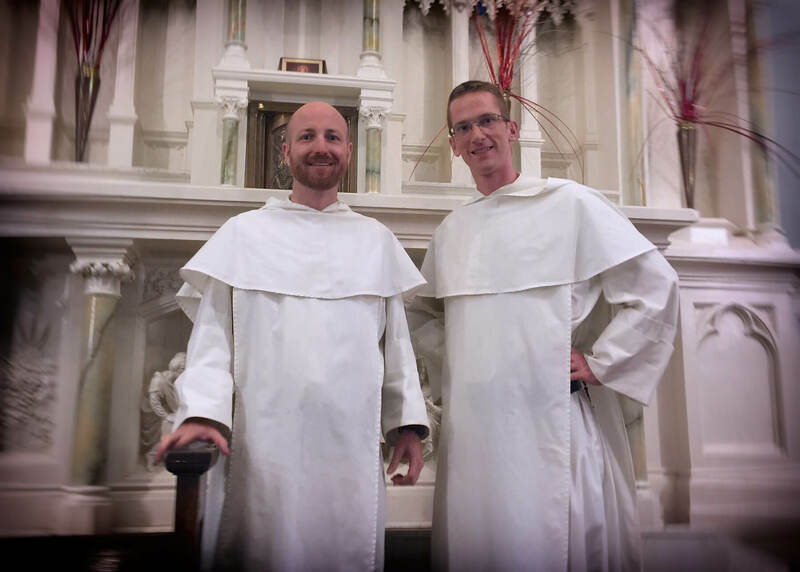 We asked them about their experience at St. Vincent de Paul and about becoming priests. Where did you attend college and what degree did you receive? Br. Brendan Baran, O.P. : Bachelors degree in Classics and History from Brown University and a Masters degree in Education from Columbia University Br. Bernard Knapke, O.P. : University of Cincinnati: B.S. in Mechanical Engineering & M.B.A.
Br. Brendan Baran and Renée Bailey, Program Manager at Roberts Hall, during a client picnic. 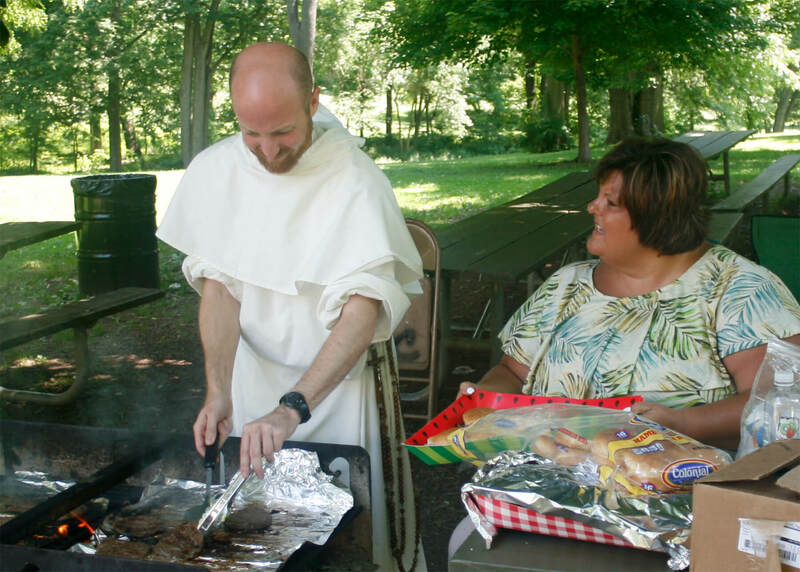 What have you enjoyed so far about your summer with St. Vincent de Paul? Br. Brendan: It’s great to spend the day talking with the clients, volunteers, and employees around St. Vincent de Paul. There is much work to do, and many difficulties, but there is a general attitude of hope around the campus. Br. Bernard: Just being with the people here has been a great blessing. I have been able to gain more knowledge about city life, homelessness, addictions, and much more. I am grateful for everyone who has shared a story with me. In turn, the openness of everyone to moments of prayer and seeking God have been encouraging. It is only by God’s grace that any of us are able to overcome sin and persevere in suffering and pain. What, if anything, has surprised you about your work here and with our clients? Br. Brendan: I was surprised by the sheer size of the operation. 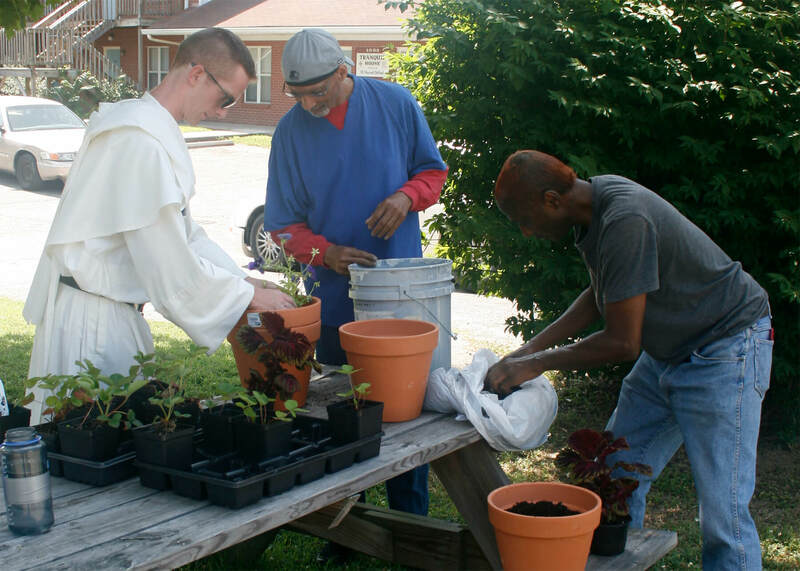 St. Vincent de Paul provides a little bit of everything for the needy in Louisville. Br. Bernard: In the past, my experience of St. Vincent de Paul has been exclusively with thrift stores and clothing drives. This is really important work, and I was halfway expecting to see more of that here. The outreach I have encountered in Louisville has been astonishing. In my head, I think of this campus and its satellite locations as a little village inside of Louisville. It has housing, a place to dine, a place to pick up food, and plenty of places to just get back on your feet. Adding to this, the people here—clients, volunteers, employees, and others—treat this place like a little village. There are meetings, there are advertisements, and there are newsletters. The communal attitude makes a big difference with regard to the success of the programs here, and it can be seen clearly when former clients come back later to help. When did you know you wanted to become a priest? Was there a defining moment or experience that solidified this desire? Br. Brendan: Looking back, God was tugging my heart towards the priesthood since I was a boy. However, it took me a while to really listen to him and to summon the courage to follow this path. After more than a decade of working in schools as a teacher and administrator, I took the plunge and entered with the Dominican Friars in 2016. Br. Bernard: I began to discern the vocation to priesthood more earnestly in college. At the time, many things were “on track” for me. I was doing well in school and close to obtaining my engineering degree. I was dating a wonderful young woman. I was still intent on moving back home to have a family and live the dream. But—and this is all due to God’s special graces—things began to change in my heart halfway through college. There was a restlessness and dissatisfaction with the direction I was then taking with my life. There were at least two defining moments for me. The first was at Mass one day at the church near the University of Cincinnati. I was one of the readers for Mass. In the back of the church, before the procession, the priest asked me if I had ever considered becoming a priest myself. I was tongue-tied in the moment. And because of where my heart was at that time, the remark struck something deep in me. I wept for the entirety of that Mass—a full hour. I’ve never cried like that before. The second and more definitive moment came during my last work co-op term in college (at UC, engineering students alternate between school and work for five years). My last co-op rotation was in Munich, Germany, and the whole experience abroad was life changing. I made several pilgrimages during that time, one of which was to a little village called Altötting. In this village is a small chapel where many miraculous healings have occurred and it is only a few miles away from the birthplace of Pope Benedict XVI. I was riding my bike along the river nearby while praying my Rosary. After finishing the Rosary, I felt a great openness and vulnerability. I had a hunch at that time that God might be asking me to make a radical change in my life and to pursue the priesthood. What areas of study are you undertaking? Br. Brendan: I am currently finishing my studies in philosophy, and will start taking a few courses in scripture next year. Br. Bernard: Currently, theology, which includes, among other things, studying Sacred Scripture, the Church Fathers, and St. Thomas Aquinas. Br. Bernard Knapke, along with Tranquil House and S.R.O. residents planted flowers around campus. Tell us something about your chosen name. Br. Brendan: I chose to keep my baptismal name, since St. Brendan the Navigator provides a great example of leaving everything behind and setting out across unknown seas in order to spread the news of Jesus Christ. Br. Bernard: When men enter the Order, they receive a “religious name” along with the white habit that we all wear. The way it works is that we submit three names that we would like (and one of those could be our baptismal name) and then the Novice Master and Prior decide on what our name will be. I submitted the name Bernard for at least three reasons. First, four of my sixteen great-great grandparents (the ones who emigrated from Germany) had the name Bernard in some form—Bernard, Bernadiana, Bernadine, and Bernard. I wanted to be rooted in my family history and to be reminded to pray for the repose of the souls of my deceased relatives. Second, I was confirmed as a Catholic in St. Bernard Church of Burkettsville, OH. Third, St. Bernard, the saint who died in 1153 A.D., is a true inspiration. He was a monk and eventually an abbot; a great theologian and a devout writer of the Blessed Virgin; and a faithful and influential preacher—which is what all Dominicans aspire to be. He who so often emphasized love and the contemplative life, I thought, would serve as a good example for me in my life as a religious. Tell us something about yourself. Br. Brendan: Prior to entering the order I spent five weeks walking across Spain on the Camino de Santiago. Br. Bernard: In my childhood, my father taught me a lot about working with my hands. When I have the time and resources, I like to be in the woodshop working on little projects. I like to run and I hit the pavement whenever I can. Along with the bit I’ve shared about my vocation story and my family history, you’ll have seen that I take pride in my German ancestry. I’m rusty now, but still somewhat conversant in the German language.